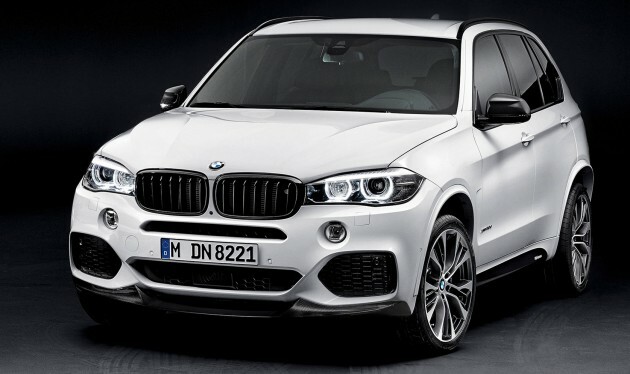 BMW M Performance parts will be available for the F15 BMW X5 from March 2014. The theme is similiar with previous M Performance parts launches – mostly carbon fibre and generally having an aftermarket look. The M Performance range for the exterior includes a black kidney grille, a front splitter and exterior mirror caps in carbon, air ducting elements, a diffuser insert for the rear apron and side sill foils with M Performance inscription, and chrome or carbon tail pipe tips. For the interior, there’s an M Performance sports steering wheel with red central marking, gear lever with carbon surface, accelerator, brake pedal and driver footrest in steel and BMW M Performance floor mats. It’s not all show parts though – there are some go bits too. You can equip your X5 with BMW M Performance brakes with blue calipers. If you have an X5 xDrive35i, you can install the BMW M Performance Power Kit which increases output to 326 hp and 450 Nm of torque, increases of 20 hp and 50 Nm respectively. The BMW X5 xDrive35i also has the option of a BMW M Performance silencer system for a sportier sound. Read our review of the F15 BMW X5. I will get TRD performance tuning package for my hilux instead of the german M.My hilux look better than beemer though. Your TRD performance kit is for upgrade or downgrade? 15% performance reduction for better RV? was “junk”, use your junk pick up compare…..SUV? you sounds a bit…..funny! Fake person using my name. BMW is a rip off company. They will bring this car in and charge RM$1 million for it and give their loser 2 year warranty to back it up. Only car company in Malaysia now giving 2 years warranty!